July 10, 2014— Tiburon, CA. Jon Peddie Research (JPR), the industry's research and consulting firm for graphics and multimedia, reported in its newest gaming market study that the PC Gaming Hardware Market, which consists of personal computers, upgrades, and peripherals used for gaming, is strong and healthy amongst the backdrop of general declines in the PC market. Gaming has become one of the cornerstones of the entire home and personal PC market. 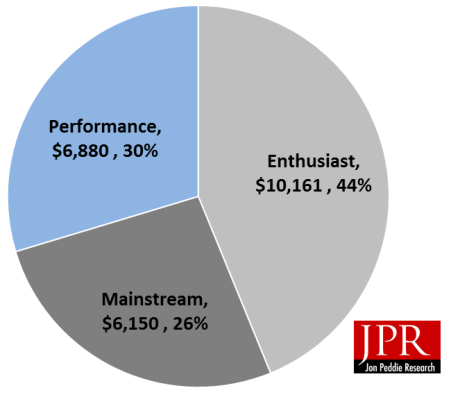 As major companies evaluate their marketing and R&D budgets, JPR is seeing more investment in gaming oriented designs, and more money spent advertising to this group of consumers. The PC Gaming Hardware Market is very diverse amongst its different segments. The high end Enthusiast segment is very performance and style oriented much like sports car owners. While the low end just wants to play games on something and this is why the segment is under threat from cheaper gaming solutions. The Worldwide PC Gaming Hardware Market report series by Jon Peddie Research which covers 33 countries, notebooks, desktops, DIY, and accessories, comes in three versions: Enthusiast, Performance, and Mainstream, with each version selling for $7,500 and the set of three for $15,000. In addition, with the set is a summary report of the Total PC Gaming Hardware Market worldwide and subscription discounts.